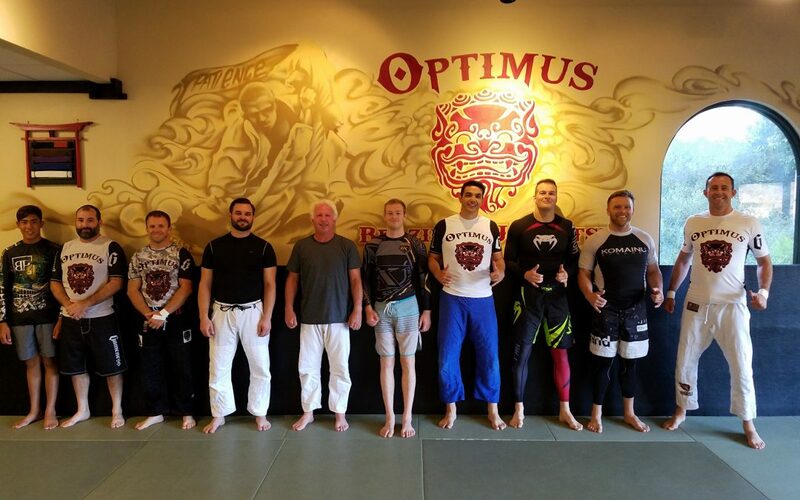 Round out your game at one of the newly added No Gi Jiu-Jitsu classes at the Optimus Academy. Try our Adult No-Gi Class on Fridays at 6:30p. Round out your game at one of the newly added No Gi Jiu-Jitsu classes at the Optimus Academy. Try our Adult No-Gi Class on Fridays at 6:30p. Our No Gi Jiu-Jitsu classes will help you test your martial art skills in a new environment and challenge you to employ varying strategies that ultimately improve and evolve your game. This faster paced version of the traditional grappling game removes drag created from wearing the Gi and does not allow for material grips. Common training gear is a rash guard and shorts or Gi pants, as well as any protective gear you would wear in a Gi Class. By training no-Gi, students increase their game speed, improve endurance & explosiveness, and are challenged to focus their strategy on no-grip related positions & submissions, such as: closed guard, butterfly guard, x-guard, back-takes, rear naked choke, guillotine, arm bar, triangle, darce, and foot locks. While most jiu-jitsu players train predominantly in either Gi or no-Gi, the most versatile players train both styles to round-out and improve their overall grappling game. Conditioning yourself with skills and techniques from both styles will enable you to intuitively react and adapt in the moment, employing a larger arsenal of techniques as a situation demands.